Not content with offering a premium midsize sport ute that screams from 0-60 in less than 5 seconds, reaches over 170 mph on a straight track, and pampers passengers with matchless Euro-luxury, Porsche is taking its 2016 Cayenne a step further with a brand new uber-potent trim. That’s right, the upcoming 2016 Cayenne lineup will include not only the traditional Base, Diesel, S, GTS, E-Hybrid, and Turbo iterations from 2015, but also an even more potent (and now flagship) Turbo S trim. Again, all these over-the-top Cayenne screamers will be delivered with one of two intelligent all-wheel drive (iAWD) configurations. Higher-end versions include a 2-speed transfer case and skid plates for some mild backwoods bushwhacking. Turbocharged variants, meantime, boast the ubiquitous sport-tuned suspension, as well. All 2016 Cayenne variations will continue to offer 5-passenger seating, with non-hybrid variants boasting a decent 62.9 cubic feet of cargo area (with the rear seatbacks folded). The plug-in Cayenne E-Hybrid trim, carrying a hefty battery pack, cuts carrying capacity to 59.7 total cubes. Also confirming the legendary Porsche cachet, the upcoming Cayenne lineup boasts 5 distinct engine choices, with the Turbo trim’s twin-turbocharged V8 tweaked a bit to become worthy of the debuting Turbo S.
To begin, all Cayenne trims are managed by a capable 8-speed shiftable automatic transmission, with optional, steering-wheel-mounted paddle shifters. The base Cayenne powertrain remains a normally aspirated 3.6-liter V6 engine capable of a commuter-friendly 300 hp and 295 lb-ft of torque from this unadorned V6. Mileage is unavailable in any Cayenne iteration, as this hefty ute’s curb weight exceeds the EPA’s testable standards. Next up is the 3.0-liter turbodiesel V6, standard in the Cayenne Diesel. Expect 240 hp and a hefty 406 lb-ft of torque from this force-fed oil-burner. Drivers of the Cayenne S and GTS versions enjoy the return of 2015’s potent 420 hp, 406 lb-ft of torque courtesy of a 3.6-liter twin-turbocharged V6 powerplant. Top end from this turbo V6 is 161 mph, with a 0-60 time clocked by Porsche at 5.2 seconds. The Cayenne E-Hybrid, meanwhile, again offers a standard, supercharged 3.0-liter V6 gasoline-burner combined with a plug-in-capable electric motor to put out a combined 416 hp and 453 lb-ft of torque. A 3.6 kilowatt plug-in charging system that will juice-up the battery in about 2.7 hours comes standard. Meantime, an available 7.2 kilowatt system will recharge the system in about 1.3 hours. Further, Porsche claims that the 10.8 kWh battery pack will allow cruising at up to 78 mph on electric power alone, while engaging the V6 will get you a top-speed of 151 mph. The 2016 Turbo trim, once king of the Cayenne hill, again sports a twin-turbocharged 4.8-liter V8 powerplant that’ll throw down 520 hp and 553 lb-ft of torque. With a top-end of 173 mph and a 0-60 time of 4.2 seconds, this force-fed screamer will get even the latest of starters to the airport in plenty of time to make their flight. Finally, look for the brand new 2016 Turbo S to boast an even more up-powered version of the twin-turbocharged 4.8-liter V8. Producing an incredible 570 hp and 590 lb-ft of torque, this beauty will grab a 176 mph top-end, and a 3.8-second 0-60 time—according to the folks at Porsche—meaning those late starters can stop off at the track for a couple of hot laps and still make their plane. Goody-wise, and depending on the trim selected, this posh Porsche people-hauler will again boast 18- or 19-inch alloy wheels, a rear spoiler, and a power liftgate. Additionally, drivers and passengers will enjoy the standard leather upholstery, power-adjustable front seats, full power accessories, and a cooled storage bin. All variations will include cruise control and telescoping tilt-wheel steering, not to mention dual-zone auto climate control, and a remote garage door opener. Techno-wise, look for the 2016 Cayenne lineup to remain delivered with standard Bluetooth hands-free technology and voice-activated navigation. Lower trims, meanwhile, are expected to return with a 100-watt audio system boasting a CD player and 10 speakers, and upper-echelon editions will again deliver standard satellite radio, as well. Higher-level Cayenne trim variations, meantime, will also offer, besides a standard power sunroof and memory for driver settings, a more athletic drive with the already-mentioned upgraded AWD, not to mention the traditional adaptable sport-tuned suspension components. Expect options for the several 2016 Cayenne variations to remain mostly in package form and to include either Bose or Burmester premium stereo systems, along with Surround Sound speakers, upgraded leather upholstery and cabin accents, upgraded and up-sized wheels, an auto-dimming rear-view mirror, and a rear-view camera. Heated and ventilated rear seats, as well as upgraded memory for driver settings can also be added for some extra cash. Standard safety features aboard all 2016 Cayenne iterations include 4-wheel antilock brakes (ABS), front side-mounted airbags, front and rear head airbags, LED running lights, front fog/driving lights, self-leveling high-intensity-discharge (HID) headlights and a remote antitheft alarm. Higher trims throw in standard turn-signal-integrated mirrors, while optional safety equipment across the lineup remains the popular Park Assist safety package, along with such add-ons as adaptive cruise control, lane-keeping assistance, blind-spot monitoring, and forward collision alerts. 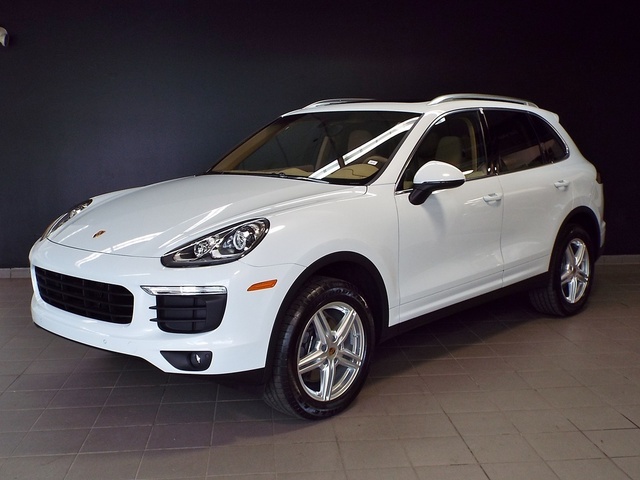 What's your take on the 2016 Porsche Cayenne? Users ranked 2016 Porsche Cayenne against other cars which they drove/owned. Each ranking was based on 9 categories. Here is the summary of top rankings. 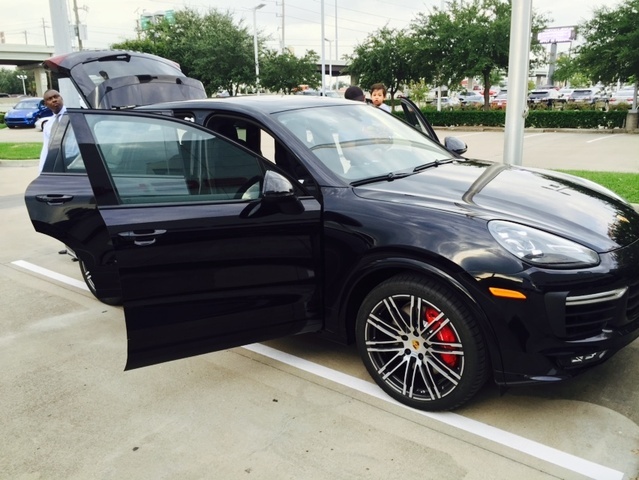 Have you driven a 2016 Porsche Cayenne? I Sent In Picture As Requested, Is My Ad Live?? You requested a picture with a number in the window. Please let me know if you need other information to get my ad live. Is the CarMax extended warranty protection a reliable, honest and easy to work with company?